Since The Wookie was gracious enough to share this beer, you’ll be getting two reviews in one post. Lucky you! Appearance: Deep brown with a reddish tint when held up to the light. Slowly dissipating one inch head. Aroma: My cold lingers on, so my nose wasn’t playing very nicely. What I did get was rye, rye, and more rye! Taste: Starts off with rich, roasted malt. The rye spiciness kicks in at mid-palate and carries you to to a long, dry finish. After the first few sips, I asked The Wookie about the ABV. I was shocked to hear that it was a 7.8% beer! I know I’ve used the term “boozy” on several occasions, but this beer is from it. Deceptively smooth and easy drinking is how I would describe it. Since the Heavy Seas Rye Porter is a limited edition beer, I can only hope that they’ll brew up another batch in the near future. Better yet… maybe Frank and Neil will open up their own microbrewery and bottle it up themselves. Aroma: G-lo cold wasn’t killing his senses that much. There is not much aroma with this one but what you do get is toasty hints of malt and rye. Taste: Roasty malt goodness punctuated by the pepper spice of rye. This is a very dry beer with an almost astringent quality. I love rye beers, so much so that when LimpD saw this one he remarked, ” … you and your rye beers again!” The funny thing is I don’t usually like porters and picked this one up because I wanted to explore what else Heavy Seas had to offer and I was happy I did. It’s too bad this is a limited edition brew because I would love to try in again with a bowl of chili on a cool fall night. I will say if you find a bottle of this one pick it up while it is not a groundbreaking brew it is a damn fine beer and worth a try. I haven’t tried the Rye Ale, but I did get a mixed pack back in January for a ski trip. I personally didn’t care for the Gold Ale – it kinda fell short IMO, but I loved the Pale and Marzen beers! Delish! I really love the pirate on the bottle too – aargh! I picked up a couple of bottles of the Pale Ale when I grabbed this one and I didn’t like it as much as the Gold Ale I had a few weeks ago. It may not be a fair comparison as the Gold Ale was on draft in Baltimore and the Pale Ale was bottled and sitting on the shelf at my local NJ brew purveyor for who knows how long. I have a enough Heavy Seas to say they make a solid brew. Ahh… maybe I need the Gold Ale on tap. Everything’s better when it flows freely! Sure, I buy a couple of bottles for the label and get a lot of grief but, if the bottle has a pirate on the label, then that’s okay. Of course, I might be ignoring the fact that my purchase may have been some sort of berry infused beverage while you have purchased a rye ale but I say that is irrelevant. I buy things that taste good that just happen to have pretty packaging. You and my man G-lo by Berry Beers and Root. My only “pretty packaging” driven purchase in recent times was the Kraken. That was some damn good and damn cheap rum. 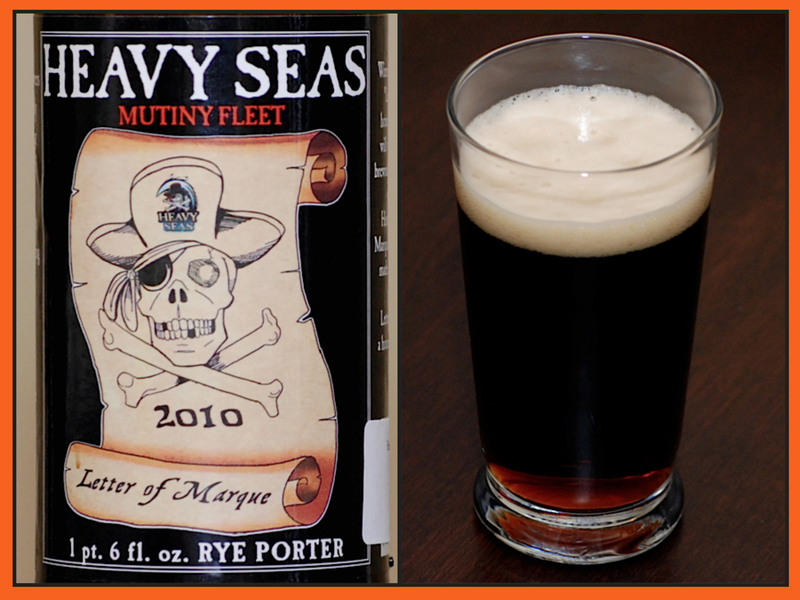 IDEA: Heavy Seas Porter and a shot of Kraken = a Release the Kraken Bomb …. Arrrrrrgh! Cigar City Brewing Jai Alai IPA. Stay tuned for a full review. I had at least one Heavy Seas brew back when I lived in PA and remember loving it – I’m going to have to see if I can get ahold of some of this when I’m out there visiting next. It sounds amazing. Very good beer, but Summit Rye Pale Ale and Bear Republic Hop Rod Rye are just as good and probably a bit better. And then there’s the Two Brothers Cane and Ebel Red Rye Ale. I don’t think Summit is not making their Batch 5 Rye Pale Ale anymore. It was a limited release and I am not sharing the few bottles I am hoarding. The Hop Rod and Red Rye Ale are good but I think the best Rye beer is coming from Terrapin. Their Rye Ale is great but their Rye Squared is amazing (review coming on May 5th). The Sam Adams Rev. Rye is not good. It smells like a good rye beer but there is nothing in the taste. No more Summit Rye??? That makes me sad. Damn good beer! Better put a padlock on that beer fridge. No need for a padlock. I have a 45lb mini attack wookie that protects my property.